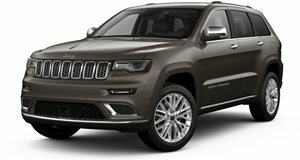 The Jeep Grand Cherokee is available in a range of engines from a 240 hp 3.0-liter diesel right up to a 475 hp 6.4-liter V8 monster. A pair of more sensible 290hp V6 and 360 hp V8 engines complete the line-up and all are available with an 8-speed automatic transmission. Rear-wheel drive or all-wheel drive is offered depending on trim levels. Performance is strong throughout although the interior quality and refinement levels trail newer offerings. Specification levels are generally good but you will have to pay up if you want navigation, adaptive cruise control and autonomous braking. 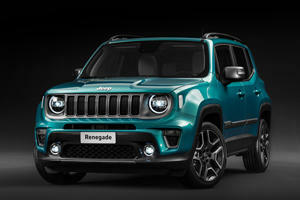 When you hear a large SUV has been given the name Trackhawk there’s a certain picture your mind creates to go along with it – and you’re likely to be right. The Jeep Grand Cherokee Trackhawk looks as big and mean as the name suggests, and the powerplant has the goods to back up both the name and those looks thanks to having a rather over the top power output of a massive 707 hp available – it’s basically a Hellcat in SUV form. 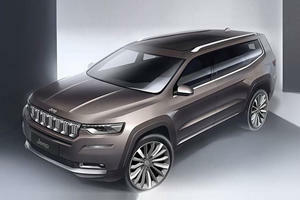 Horsepower isn’t everything though, and so Jeep also upgraded the Cherokee in all the right places resulting in an SUV that’s shot to the top of many want lists. When an automaker creates a mean, limited edition vehicle of any kind, you can be pretty sure that the interior will usually be fitted with all the best bits as seen in the regular range-topper for the model, in this case the Grand Cherokee SRT. There’s tailored trims to remind you what you’re in though; the power-adjusting sports seats feature the Trackhawk logo on the two-tone black and red leather exclusive to this model, as well as on the lower part of the multifunction steering wheel. The same logo will flash on the 8.4-inch screen heading up the infotainment system. There’s brushed aluminum all over as standard, and that can be had in a carbon fiber trim if you have cash left over after paying the already high price. Another telltale sign that you’re in a 5-seater that does silly things is the instrument cluster that’s topped off at an insane 200 mph. When you climb inside a Jeep Grand Cherokee Trackhawk, start it up and flatten the gas pedal, you had better hold on tight. With over 700 horses wanting to get out, the power can be overwhelming to the point that panic can set it. Using all the power probably isn’t a good idea on regular roads, but the Trackhawk will be fun to play with at the track, be it a drag strip or circuit. Steering is a little heavy, but you can still point and squirt and the SUV listens. Handling is good, the same as in the SRT albeit a little stiffer to compensate for the heavier weight. Massive discs and Brembo calipers help reign in the Trackhawk from silly speeds. Besides the monster power, the SUV can easily be a daily driver, and the driver friendly transmission also lends to this, but even with small throttle inputs it’s the Trackhawk has a drinking problem. The “normal” Jeep Cherokee SRT 8 is fitted with that big 6.4-liter V8 with 475 hp and 470 lb-ft of torque and in most cases this would be more than enough power to satiate the need to have the biggest, best and fastest, but strangely there was a demand for even more and so Jeep obliged. The capacity drops to 6.2-liters for the V8 in the Jeep Grand Cherokee Trackhawk, but a supercharger was added in to get the power up. The result from this makeover is a power bump to an impressive 707 hp with 645 lb-ft of torque making it the most powerful factory SUV to date. An 8-speed automatic transmission (with manual shifting) connects the power to the all-wheel drive system to run a 0-60 mph of 3.5-seconds and an 11.6-second quarter mile. Things inside the Trackhawk are pretty much the same as what you get in the SRT version. There’s a high performance Harman Kardon audio system with 18 speakers and a sub woofer, Selec-Track to choose different drive modes and the 8.4-inch Uconnect touchscreen. The screen displays all on board functions including navigation, the trailer hitch view from the ParkView backup camera and Performance Pages Plus that relays real time performance data like boost, G-force, performance timers and horsepower – among many other things. Safety includes 4-wheel traction control, an array of airbags, adaptive cruise control, forward collision warning and trailer sway damping. The Jeep Cherokee Trackhawk is the answer to the needs of well-heeled performance mad adrenaline junkies who want to be able to pack at least 5 people in for a high-speed drive. It’s every bit SRT in terms of fit, finish and build quality with just a few items branded with the Trackhawk logo. It’s the most powerful SUV of it’s kind in the world being the only one cracking the 700 hp power rating and is capable of a 3.5-second 0 – 60 mph run with a top speed up at 180 mph. It’s a consummate daily driver and a ridiculously fast weekend warrior – as long as you keep it on the black stuff. But what will this second mystery three-row SUV be? Ram will also benefit from a massive FCA investment.